Alengo Nyamay’antu (PhD), Scientific Support Specialist at Polyplus-transfection, talks about transfection trends in genome editing. She provides an overview of solutions to deliver both guide RNA and Cas9 nuclease into cells. 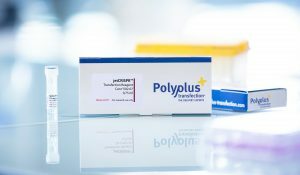 Polyplus-transfection developed jetCRISPR, a new RNP transfection reagent to deliver both gRNA and Cas9 protein. Interview filmed by The Scientist.